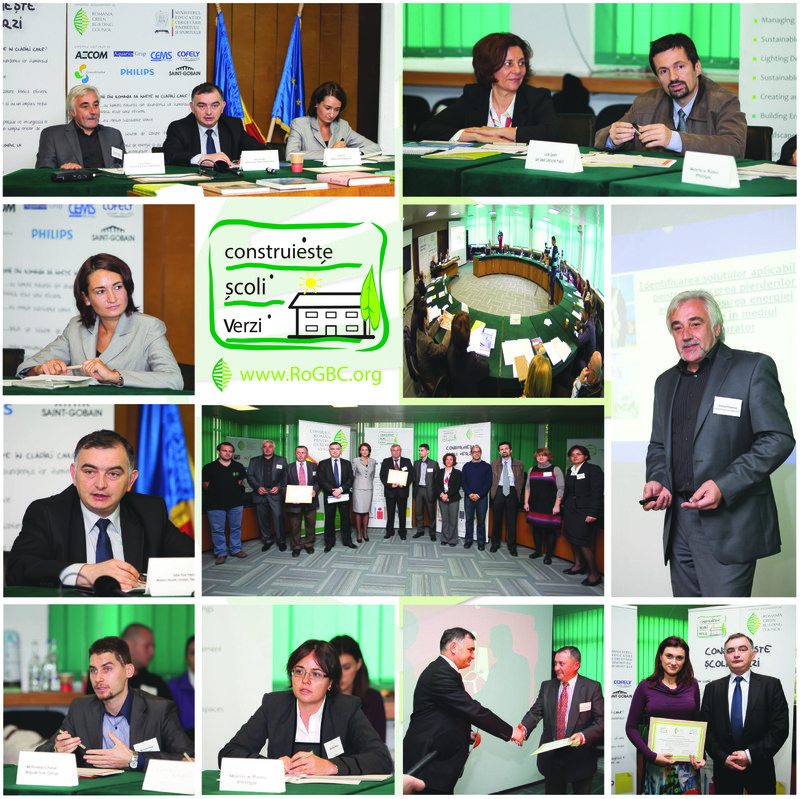 Bucharest, October 24th, 2012 – Romania Green Building Council in partnership with the Ministry of Education, Research, Youth and Sports represented by Mr. Stelian Victor Fedorca, as State Secretary for middle education organized a press conference for announcing the winner of the national campaign “Building Greener Schools”. The goal of this campaign is to take action to renovate and construct Romania’s kindergartens, schools and universities toward better environmental and energy performance. The contest was organized in coordination with Green Apple International Day Of Service – an initiative created by the Centre for Green Schools with the US Green Building Council (USGBC) supported by the World Green Building Council (WorldGBC) and implemented by the Romania Green Building Council (RoGBC). More than 1250 service projects took place in 49 countries on every continent around the world out of which 7 projects were organized in Romania, by students and their teachers from kindergarten through high school that emphasized the importance of taking better care of the environment, the importance of educational establishments in the context of improving health for the users of the school buildings, reducing absenteeism, obtaining better results in study performance and the diminishing of maintenance costs and energy consumption for the national educational system. All schools in Romania interested in expanding their efforts to change the design, construction and operation of education facilities with the objective of engaging children’s learning experiences were invited to participate in a contest to win a substantial prize package to green their school. The contest has been organized in partnership with the Ministry of Education, Research, Youth & Sport. To be eligible to win, schools in Romania had to conceive, upload, and conduct a “green project or event” on September 29, 2012. In addition to describing the intended project or event within www.MyGreenApple.org, applicants had to indicate a brief statement for supporting a green renovation project by the school principal, local school administration official, and by the mayor of the city (if possible). We were pleased to receive submission from kindergartens, schools and high-schools from different cities in Romania. Most of the service projects involved outdoor activities with the help of the entire school community: children, teachers and partents. Ion Neculce high-school; Project name: ”Ride the bike no matter the age”. 2012 was declared by the European Commission the European Year of Active and Intergenerational Solidarity. This is why the school initiated a campaign in collaboration with the Municipality of Bucharest to promote bicycle use for leisure as a means of recreation and healthy life at any age. High school students opened dialogue with people of the third age and promoted the message of maintaining an active life with unique illustrations created by the students. The problems on the building side are: improper HVAC equipment and high energy bills. George Cosbuc high-school. Project name: “Blossoming the Enviroment”; the studentscleaned the green spaces within their schoolyard in order to have a more proper view and tidier surroundings. The major problem the school is facing is the roof, that is sticked to the superior level, hence it generates eater infiltrations during rain season. Transilvania College: The teachers, parents and children of Transylvania College got together for the Annual Welcome Brunch, that this year had an environmental theme, to celebrate “Green Apple Day of Service.” The event took place outdoors, in a beautiful wooden area. The children participated in an Origami workshop where they learned to make green apples out of recycled paper. All the apples adorned the Transylvania College tree, their school symbol. Biobee Kindergarten: Play is an essential component of healthy development in children, and playgrounds provide an opportunity for children to develop motor, cognitive, perceptual and social skills. Unfortunately, playgrounds are often the sites of unintentional injuries. The leading cause of playground equipment-related fatalities is strangulation, and the majority of these deaths occur on home playgrounds. The event organized by Biobee Kindergarten had a simple purpose: to raise the level of awareness within adults to take care of parks. The action took place in the Center Park of Cluj City. Children brought apples with them and played games, made drawings and paintings. The kindergarten wants to reduce their heating expenses and proposed as an option radiant panel usage. Cojocna Middle- School: Project Name: “Recycle waste for a cleaner nature”; Motto: “Don’t through away today what you can use tomorrow!” Students made from recyclable materials like: PET, aluminum, cans, straw, paper, wood, polystyrene, plastic bottles etc paintings and hand made craft that will be displayed within the school’s green corner, to demonstrate to their colleagues and parents and that want a green change in people’s mentality. The schools needs a renovation, as the building is one century old and has a very low energy efficiency. Sibiu: Casolt Middle School; “We care” project – rehabilitation of schools surroundings; planting flowers and trees. The building has no thermal insulation, heat losses are very high as the windows haven’t been replaced since the initial construction. Dambovita – Gura Sutii Kindergarten: cleaning the kindergarten’s courtyard that is full of plastic and paper waste. The schools needs to finish the works with the building envelope. WINNER:Alba Iulia: Câlnic middle school: “A better school for a better future” – the students became involved in cleaning the school surroundings and those of the Medieval Fortress. The building dates back to the 1900s and thus, it is 112 years old and has never been restored or modernized. The school is truly placed in a delicate position – it needs running water in order to obtain the health permit, it needs thermal insulation of the entire building and also replacement of present wooden joineries with energy-efficient ones, electric installation replacement, addition of toilets and also classroom repairs – plaster, paint etc. “For the winning school in Câlnic, Alba county, it is very important to involve the local community within the renovation process, an aspect that will help stimulate the development of the local economy and the increase of the professional skill of the locals, as well as the level of awareness of those involved in the educational system, regarding the long-term maintenance of technologies and investments” said Stelian Victor Fedorca, State Secretary for middle education within the Ministry of Education, Research, Youth and Sports. Cristian Popescu, General Manager Cofely Romania pointed out a few solutions and technologies for a successful green renovation, solutions that any local administration, school principal or school administrator could easily implement. “A green school is a building that offers a healthy and positive environment, at the same time allowing energy and resource savings while reducing the maintenance budget”, said Cristian Popescu. AECOM – Global services contractor for professional technical support and management for a wide range of markets, including the service market, as well transport, environment, energy, water and government markets. For the renovation project, AECOM will be providing architecture and design services based on green building principles. Aquarius Grup – Project Managers, Cost Managers, Quality Controllers, Investor Representatives, Project leaders, Financers’ Representatives, Planners, Site Supervisors, BREEAM and LEED Evaluators, Independent Experts. Aquarius Grup will be providing site overseeing, technical analysis, construction management, construction supervising. Cofely Romania – HVAC, Sanitary Installation, Electric Systems and Fireproofing. The company provides facility management and energy efficiency/contracting and fitting. SAINT-GOBAIN – Represented in Romania with the following units: Isover, Rigips, Weber, PAM. Saint Gobain has acquired a solid reputation on the construction materials market because of the wide variety and high quality of the products and innovative solutions, answering to the great challenges of today’s world: economic growth, energy saving and environment protection. This company will be providing noise reduction solutions – efficient and environment-friendly. Greenitiative is a non-profit association with the goal of providing an official make-up for the personal initiatives that have a great potential of contributing to the sustainable and ecological development of our communities: Bucureşti, Mogoşoaia and Eşelniţa. The partners of the campaigns offer efficient solutions for a major improvement of the health and study capacity of our school-users as well as the energy efficiency and environmental responsibility associated with the restoration and construction process. The partners that have been so far confirmed will pay a visit, in November, to the winning school in order to perform a technical expertise. Following the report resulted in the first stage, next is the design, planning and solutions stage. Mr. Secretary of State, Stelian Victor Fedorca has expressed the wish to join the Romania Green Building council team of professionals for the visit to Câlnic middle school, in Alba county. The restoration works will take place during the summer vacatio in 2013 in order to welcome the students, in the following 2013 school year, to a new and ecological school. What happens to the rest of schools that didn’t win the first prize ? RoGBC will support the other participating schools that have signaled issues with their buildings and will use the “Building Greener Schools” campaign to involve companies that are active in the green buildings industry, in order to generate products, services and funds necessary for solving the reported issues. A first step has been taken in this direction: Saint Gobain Construction Products will help Ion Neculce high-school by fitting one of its laboratories with 70sqm of Ecophon Master Rigid ceiling tile as a noise reduction solution. The product is created by replacing the old petrol-based binder (used in mineral glass wool fabrication) with a new plant-based one. Also, recycled glass will be used in 70% of the fabrication process. Benefits for students and pupils: improvement of voice clarity by absorbing reflected sounds, thus improving the intelligibility of the spoken information and the improvement of the students’ concentration. “We were pleased to have such an enthusiastic response from the Ministry of Education, teachers, parents and students to support this initiative. It is clear that in addition to the many important considerations contributing to a quality education, the condition of the facilities where we study matter greatly.” said Cristina Siu, Leader of the RoGBC’s “Construieste Scoli Verzi” Campaign. According to Building Research Establishment (www.BRE.co.uk), Green Schools have an 18% contribution to the improvement of exam results and they may reduce maintenance and use costs with 40% up to 50%. The Romania Green Building Council (RoGBC) in partnership with the Ministry of Education launched the nationwide “Construieste Scoli Verzi” (Building Greener Schools) campaign to take action to renovate and construct Romania’s kindergartens, schools and universities toward better environmental and energy performance. The campaign included seven initiatives organized by students and their teachers from kindergarten through high school that emphasized the importance of taking better care of the environment. The RoGBC and Ministry of Education organized five additional events to train and build awareness about the importance of the school facilities themselves to improving health, reducing absenteeism, achieving better learning outcomes, and reducing maintenance and energy costs for the nation’s school system. “We were pleased to have such an enthusiastic response from the Ministry of Education, teachers, parents and students to support this initiative. It is clear that in addition to the many important considerations contributing to a quality education, the condition of the facilities where we study matter greatly.” says Cristina Siu, Leader of the RoGBC’s “Construieste Scoli Verzi” Campaign. The campaign includes a petition to gather signatures of support for green schools from citizens at events and online via the RoGBC’s Facebook campaign. In addition, each of the schools who organized green awareness events have been entered into a contest to win a green renovation of their school facility by the Romania Green Building Council and its member companies. The winner will be selected on 12 October 2012. Ion Neculce high-school; Project name: ”Ride the bike no matter the age”. 2012 was declared by the European Commission the European Year of Active and Intergenerational Solidarity. This is why the school initiated a campaign in collaboration with the Municipality of Bucharest to promote bicycle use for leisure as a means of recreation and healthy life at any age. High school students opened dialogue with people of the third age and promoted the message of maintaining an active life with unique illustrations created by the students. George Cosbuc high-school. Project name: “Blossoming the Enviroment”; the studentscleaned the green spaces within their schoolyard in order to have a more proper view and tidier surroundings. To further raise awareness about the importance of this day, Mr. Dorin Beu, President of RoGBC Transylvania joined the Transilvania College team, to speak about the health benefits of studying in green buildings. Biobee Kindergarten: Play is an essential component of healthy development in children, and playgrounds provide an opportunity for children to develop motor, cognitive, perceptual and social skills. Unfortunately, playgrounds are often the sites of unintentional injuries. The leading cause of playground equipment-related fatalities is strangulation, and the majority of these deaths occur on home playgrounds. The event organized by Biobee Kindergarten had a simple purpose: to raise the level of awareness within adults to take care of parks. The action took place in the Center Park of Cluj City. Children brought apples with them and played games, made drawings and paintings. Cojocna Middle- School: Project Name: “Recycle waste for a cleaner nature”; Motto: “Don’t through away today what you can use tomorrow!” Students made from recyclable materials like: PET, aluminum, cans, straw, paper, wood, polystyrene, plastic bottles etc paintings and hand made craft that will be displayed within the school’s green corner, to demonstrate to their colleagues and parents and that want a green change in people’s mentality. Sibiu: Casolt Middle School; “We care” project – rehabilitation of schools sorroundings; planting flowers and trees. Alba Iulia: Calnic Middle School: “A better school for a better future” – cleaning the areas around the school and the Medieval Fortress. Dambovita – Gura Sutii Kindergarten: cleaning the kindergarten’s courtyard that is full of plastic and paper waste. The prize of the contest consists in the implementation of the renovation process as described in the letter provided by the school in correlation with the evaluation report prepared by the partner companies leading the green building revolution in Romania. The campaign partners offer effective solutions to dramatically improve health and learning ability of our schools occupants as well as the energy efficiency and environmental responsibility associated with the construction and renovation process. The prize package includes planning and design services, project management, ecological building materials and coatings, sustainable landscaping, and energy efficient and green energy technology. 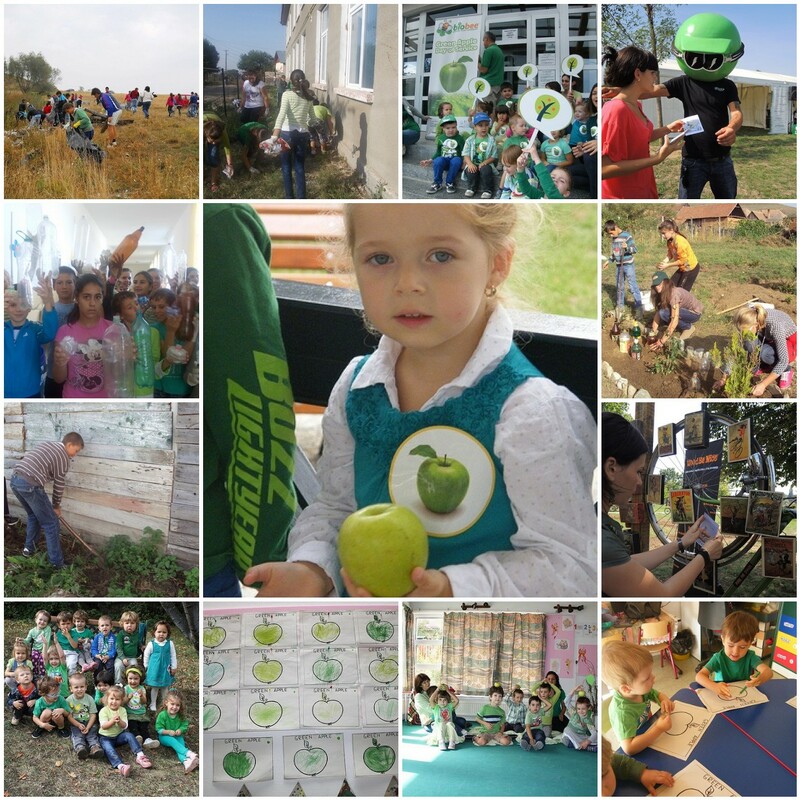 The contest was held in coordination with the “Green Apple International Day of Service”; an awareness building initiative created by the U.S. Green Building Council’s Center for Green Schools supported by the World Green Building Council and implemented locally by the Romania Green Building Council. The winning school will be announced on October 12th. Please visit www.RoGBC.org for more information. 28 to 30 September 2012 – Exhibition for Building Greener Schools. The RoGBC organized an exhibition at the National Real Estate Fair in Bucharest to demonstrate the importance of building and operating the nation’s schools to make them healthier, more energy efficient and with significantly less environmental impact. Student volunteers from the Romania Green Building Council’s Associate Member program collected signatures from visitors who wished to express their support for the Building Greener Schools campaign. Those signatures will be combined with those collected online at the RoGBC’s Facebook campaign described above. 28 September 2012 – Introduction to Green Schools discussion – dedicated to increasing understanding of why and how to design, construct and operate green schools. Cristian Popescu, CEO of Cofely Romania, Steven Borncamp, President of RoGBC, and Sergiu Vasile Moga, Director of the State Secretary’s cabinet delivered presentations to educators, school planners, facility managers and the building community. The presentation included examples to demonstrate how energy efficient and environmentally responsible solutions improve learning, increase attendance of students and faculty, improve health and save money. 29 September 2012 – Parent’s day Transilvania College (formerly International School of Cluj) – hosted parents’ day to welcome the parents and students back to the school year. The event kicked off a public campaign to raise funds for the school’s own new annex building which will be constructed to the highest sustainable construction standards. In addition, funds will be raised through the RoGBC’s “Building Greener Schools” campaign to be made available to a public school in need of a green renovation; a project to be planned an designed during this school year and completed over the summer break in 2013. Simona Baciu, the school’s Director, highlighted the recent green features of its building expansion as well as plans for the new “deep green” annex. We will count all signatures and deliver them to the Ministry of Education, Research, Youth & Sport to demonstrate the level of interest of the entire community in building and operating greener schools. environments with better lighting, including natural daylight, out-perform their peers academically. School operators receive the benefits of lower energy and other operating costs from better designed facilities. Of course, students who directly interact with sustainable buildings will not only develop a greater appreciation for sustainability but will also influence their parent’s and other members of their household. 1) Partnering with Greenitiative. 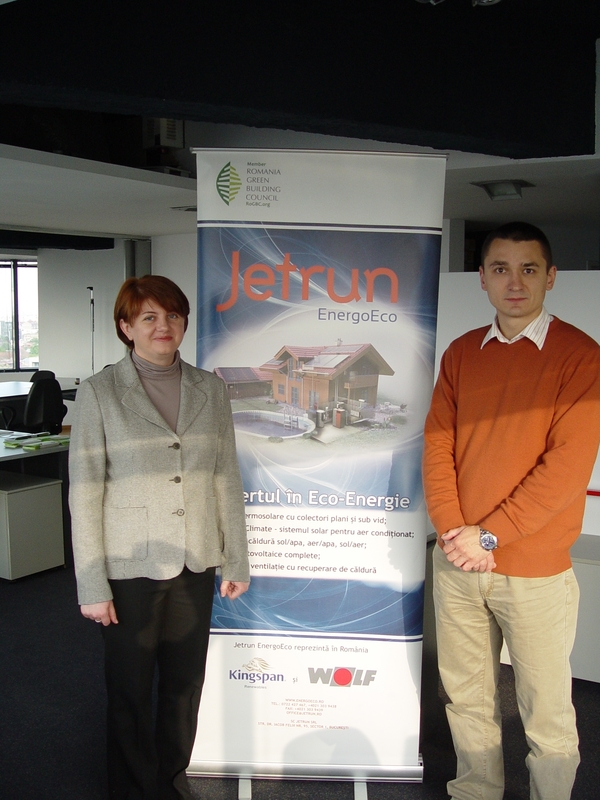 Founders Felicia and Marius Ienculescu-Popovici have been strong advocates of green education having conducted education campaigns and demonstrative projects with big plans for the future. The RoGBC has been in discussion with them and will present plans for involving our member companies in Green School renovations and new construction. RoGBC Member companies, including Jetrun EnergoEco and Naturalpaint have already been supporting their actions. 2) Partnering with local schools. The Green Building Council – led by Bogdan Draganescu Ph.D RoGBC Vice President and founder of sustainability consultancy Smart & Pepper, is reviewing selected green projects in local schools to identify cost-effective solutions with the greatest impact for sustainability. 3) Educational Materials. The RoGBC team has produced a educational brochure entitled “Save money with Green Construction” while Chapman Taylor produced a illustrative “What is a Green School” document to visually demonstrate the elements of green design thinking. We delivered this to selected teachers to pilot test discussions with their students and provide feedback to us on what they will want for the future. The interest from municipalities, school leadership, parents, and, most enthusiastically, STUDENTS is growing very quickly. Expect to see more action and projects starting in the weeks ahead. We look forward to your feedback and to hear from more of our members on their involvement in greening Romania’s schools!